The weather held out at Lytham St Annes for a glorious weekend of brass at our first Brass at the Seaside festival. Along the pier and Ashton Gardens bandstands musicians of all ages came together to put on a magnificent show of brass on Saturday 14th and Sunday 15th July. The festival was formally opened by the Mayor who commented ‘…I’m so pleased to see so many young people involved in playing music’. The day was kicked off with a great performance from Clifton Primary School Samba band. 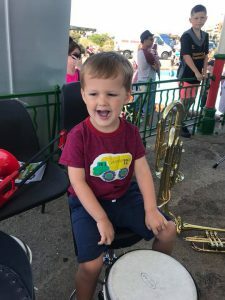 There were also a series of fun and family friendly workshops to give audience members the opportunity to play a musical instrument and find out more about the bands playing during the festival. The Saturday daytime performances culminated in an evening concert at St Thomas Church with Freckleton Band and Lancashire Youth Brass Band joining forces for a brilliant show of rousing brass. 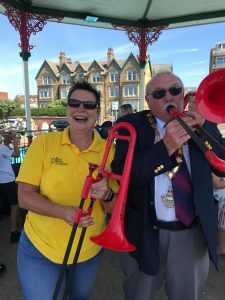 On Sunday the festival took place at both the pier bandstand and Ashton Gardens bandstand – the sun was shinning down on all the crowds at both locations, everyone chased some shade while HONK! 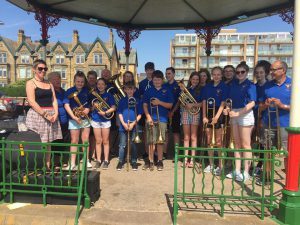 Lancashire Youth Street Band performed an exciting programme, including a fantastic rendition of ‘Eye of the Tiger’ which stopped people in their tracks! This was the first Brass at the Seaside festival and it was a joy to see so many bands come together to play great music, the bands involved included- Coppull & Standish Junior Band, St Helens Youth Brass Band, Balderstone Brass, Lancashire Youth Brass Band, Freckleton Band, West Lancashire Schools Band, Continental Brass, Charnock Richard Training Band, Freckleton Junior Band, HONK! Lancashire Youth Street Band, Astley Unlimited Band, Kearsley Youth Brass Band and Astley Youth Band. 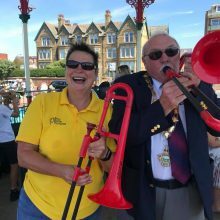 The dates have already been set for Brass at the Seaside 2019, on Saturday 13th and Sunday 14th July, and we’ve had a lot of interest from local bands, and some as far afield as Scotland and Hampshire.